Laura Mercier Tweezers are uniquely slanted, stainless steel tweezers with an ergonomic grip for complete control and easy handling specifically designed for Laura Mercier by Tweezerman®. Hand-filed tips are perfectly aligned for precise removal of hairs. Before tweezing, brush brows upward and outward with the Brow Grooming Brush. 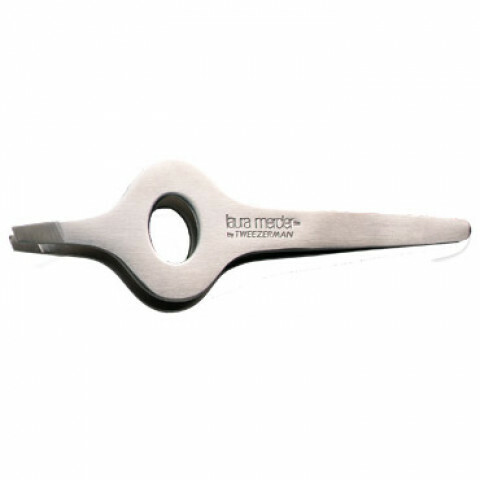 Tweeze stray hairs under the brow to open up the area between the eyes and eyebrows. Do not over tweeze - you can always go back and tweeze a few more hairs if necessary. great tweezers made by a reputable brand! These work really well and make it easy to quickly groom your brows. I really like that these are by Tweezerman. They have a unique handle on them and pluck stray hairs really well. It's easy to go overboard so you have to be careful not to overtweeze!